Happy New Year to all!! 2012 will most certainly be a year of change, progress and accomplishment. As we come off the peak of the holiday season, we can't help but relish in the flashy and "eye catching" trends of 2011. There's no doubt about it, glitter made a statement in the final months of the year. What's not to love about it? 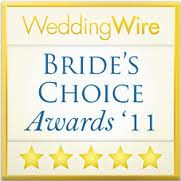 2011 truly sparkled in our opinion and gave way to a wedding trend sure to catch anyone's attention. Whether it's your makeup, your shoes, accessories or your dress itself there are numerous ways to make your wedding day sparkle! If you couldn't get enough of glitter last year, here's your glitter fix for the New Year! * How will you make your wedding Sparkle? Share your thoughts and ideas here! From all of us at Emily Weddings, Inc. Happy New Year! May 2012 be filled with unforgettable, shining moments!